The shoe design house Chaos and Harmony have released their Summer 2010/11 collection, full of sculpture and colouring. The collection goes under the name ‘Between you, me and the fencepost...’ and within this story line, like its own chapter, are three shoes titled ‘Fallen’. 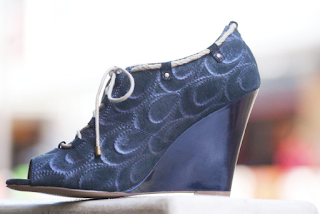 The shoe illustrated is called ‘Fallen-Blue Drop’ and is a work of superb peacock-feather motifs done in textured leather with sparkling blues and iridescence. It rests on a deep, cobalt-blue heel. The full collection numbers eighteen different designs, although it is just the ‘Fallen’ range which has the addition of cord running around the top; an almost country-like detail imposed on something very urban. It is this sort of juxtaposition and fun which makes Chaos and Harmony well worth following. Chaos and Harmony is stocked by Ultra Shoes at 55 Manners Mall, Wellington; a shop known for its adventurous stock and its willingness to supply finishing touches to many a photo shoot over the years.